Minecraft works just fine right out of the box, but tweaking and extending the game with mods can radically change the experience. Some mods are great for brand new players and seasoned veterans alike, while others are aimed squarely at breathing new life into the game after you have already seen everything that the basic game has to offer. Whether you're brand new to Minecraft, or you're just new to modding, we've put together a list of the 15 best Minecraft mods that improve graphics or performance, add useful functionality, and open up brand new worlds to explore. These mods work regardless of the platform you're using, so you can safely grab them whether you're playing on Windows, OS X/mac OS, or Linux. However, they only work with Minecraft: Java Edition. If you're playing a version of the game like Minecraft: Windows 10 Edition, or any console or mobile version, you have to buy skins, modpacks, and other content from the in-game store. Installing Minecraft mods is pretty easy, but mods aren't always compatible with each other, and individual mods aren't always compatible with the latest version of the game. If you want a seamless mod experience, consider checking out a curated Minecraft modpack like Regrowth or All The Mods, or a custom launcher like Feed the Beast or Technic. Improves the overall experience and look of Minecraft. Ability to tune your computer's performance by adjusting features and settings. Wealth of features and settings may be overwhelming at first. OptiFine is a behind-the-scenes mod that improves and optimizes the graphics of Minecraft so that the game runs as smoothly, and looks as great, as it possibly can on your computer. This is the best mod to grab, and the first one you should download, if you care about visuals and smooth gameplay. A great mod of explorers. Improves on the basic mapping included with Minecraft. Nothing we didn't like about this mod. Journeymap implements a beautiful world map that is generated automatically as you play. It includes a minimap that shows up in the upper right corner of the screen while you're playing, but you can also open up a full-screen map to view the entire world that you have explored up to that point. Since the built-in mapping feature that Minecraft includes by default is so basic and requires you to craft a bunch of stuff, Journeymap is a must-have mod for anyone who likes to explore. Greatly simplifies the act of moving a chest. Carrying a chest causes you to move and dig more slowly, and affects jumping. Chest Transporter is a mod that lets you pick up and move chests, even if they're full of items. This is pretty basic in comparison to a lot of the other mods on this list, but it's also tremendously useful. Remove everything from the chest. Place everything in a different chest or drop it on the floor. Pick up the empty chest. Place the chest in its new location. Pick up the previous contents of the chest and put everything back inside. With this mod, you can collapse all of that down to the two-step process of picking up the chest and then placing it wherever you want it. Saves you randomly experimenting or searching the internet for recipes. More easily locate and place items. Some may feel it eliminates the fun of experimenting to discover recipes. Just Enough Items allows you to immediately pull up some vital information about any crafting material or crafted item in the game. With this mod, you can instantly find out how to craft anything you see or find out what can be crafted out of anything you see. The biggest benefit of this mod is that you no longer have to experiment with random combinations, or search the internet, to figure out how to craft anything. However, it's also useful in creative mode, since it makes it easier to locate and place new items in the world. Easily see exactly what you're looking at and pull up vital information without entering submenus. Can reveal contents of containers. Pairs well with Just Enough Items mod. No downsides we've found for this mod. Here's What You're Looking At is another mod that pulls out some vital information and sticks it front and center. This mod allows you to look at anything in the game, including blocks, crafted items, and even creatures, and instantly see what it's called. In addition to the name of the item, the mod can also show information like the contents of a chest, the progress of items being processed in a furnace, and more. If you have Just Enough Items installed, this mod also allows you to look up recipes by looking at items and blocks. Marry and start a family with a villager. A complex mod that can conflict with other mods. Antivirus software may flag the download as dangerous. Minecraft Comes Alive is a mod that overhauls villagers, replacing them with a huge mixture of NPCs that you can interact with in a variety of ways. The basic functionality of Minecraft villagers is retained, in that you can still trade with them. However, there are additional dialog options and a complex relationship system that even allows you to marry a villager and have your very own Minecraft baby. If you're getting tired of the droves of identical villagers you run into in game after game, this is a great mod to install. Great mod for those who like building. Adds the chisel tool via crafting. Not much to dislike with this mod. This is a must-have mod for dedicated builders, but it's equally useful if you're new to the game and just want more customization options. The mod adds a ton of new blocks and patterns, but it also allows you to craft a chisel that lets you change the appearance of blocks by smacking them. Beekeeping introduces fun new options. Adds more than a thousand new food items. Beyond the inevitable bug or two, there's nothing to dislike here. Pam's HarvestCraft adds a ton of food and farming options, which makes it the perfect mod to grab if you're bored of pork chops and watermelon slices. In addition to new foods and plants, the mod also includes a beekeeping system, which adds even more new gameplay. Adds dozens of new biomes. Allows you to create a more diverse world. Existing worlds will need special treatment when adding this mod. Biomes O' Plenty adds a ton of brand new biomes when generating a new world. This mod was introduced when Minecraft only included a handful of default biomes, but it's still good if you're tired of the standard biomes or just want to generate a world with a whole lot more diversity. This mod retains all of the default biomes, but it adds dozens more, including a mystic grove populated by pixies. 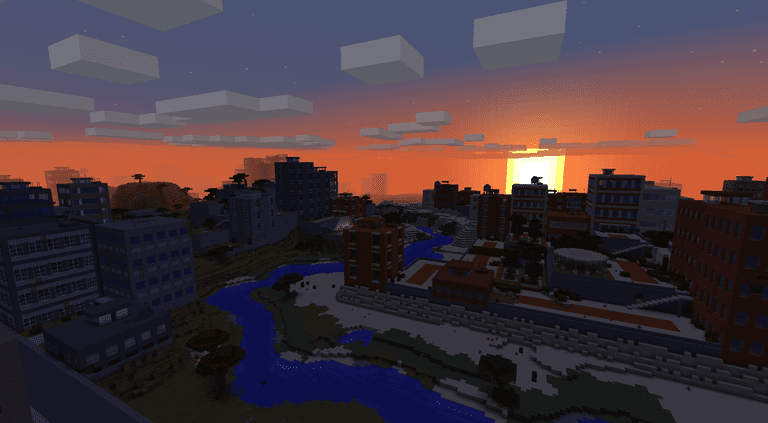 Add a post-apocalyptic flavor to Minecraft. Can be added as a dimension you travel to from your world. Only usable on the server-side. The Lost Cities is a mod that lets you create a world populated by hauntingly crumbling cities. This is a great mod to grab if you're getting tired of the same old Minecraft biomes, or you just want a different type of survival experience. Strip mine without marring the Overworld. This mod adds a brand new dimension to Minecraft, literally, in the form of a flat expanse made just for mining. If you're a serious builder working in survival mode, and you don't want to ugly up your world with massive strip mines, you absolutely need to grab this mod. The way Aroma1997's Dimensional World works is that you craft a portal, similar to a Nether portal, out of a new kind of brick that the mod introduces. Activate the portal with a tool that the mod also introduces, and you're whisked away to a specialized mining dimension. More to do for seasoned players. Powerful new items and new boss. Some features not yet implemented. Draconic Evolution adds some much-needed endgame progression and gear for players who have already plumbed the depths of the Nether, ventured to the End, knocked out the Wither and the Ender Dragon, and come up wondering what to do next. This mod adds a ton of new gear, items, blocks, and a boss that can even kill you in creative mode. Adds a new experience in a new dimension. New content available when combined with other mods, like Chisel. The Twilight Forest adds a new dimension filled with a ton of new blocks, items, creatures, and a progression system. If you're looking for a fresh, new Minecraft experience set in a brand new world, this is a great mod to grab. Since The Twilight Forest is set in a separate dimension that you access by jumping into an enchanted pool, you can run it alongside a lot of other mods without disturbing anything. Build rockets, space ships, and space stations. Requires Libvulpes mod to run. Advanced Rocketry is another mod aimed at seasoned players who have already seen everything that Minecraft has to offer. Instead of adding a new dimension, it offers up a deep new crafting system that allows you to build and launch rockets. The progression doesn't end there, though. Once you've launched a rocket, you can also build space stations and even explore new worlds. To use Advanced Rocketry, you will also need the Libvulpes mod. Better implementation of VR for Minecraft than Windows 10 edition. Works with VR headsets compatible with SteamVR. Keyboard and mouse control option is awkward and less enjoyable. Using tools with physical motions, such as bashing, can be tiring; button press option is easier. ViveCraft adds virtual reality (VR) support to the Java version of Minecraft, which allows you to play the game with an HTC Vive, Oculus Rift, or any other compatible VR headset. If you've ever wanted to play Minecraft in roomscale VR, and physically walk around inside your creations, then this is one mod that you absolutely have to check out.